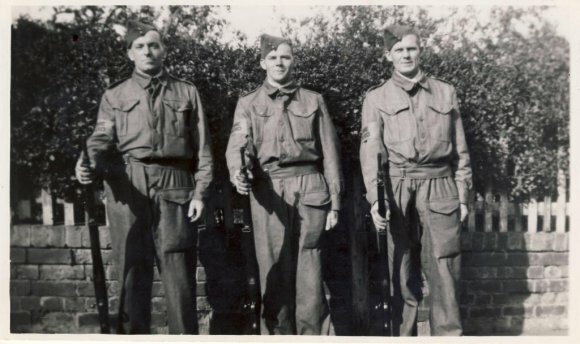 Chelveston Home Guard - L to R - Art(hur) See, Walt Bridge (later promoted to L/Cpl) and Percy Felce (later promoted to Sgt). 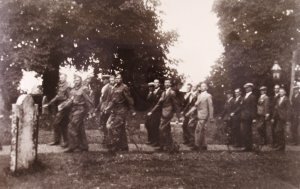 The Northamptonshire Local Defence Volunteers (LDV) were formed in May 1940 following an appeal by Anthony Eden (Secretary of State for War) for volunteers in reserved occupations or those either too young / too old to join the regular forces, to form a local defence force. Its commander was Major General Sir Hereward Wake, Chairman of the Northamptonshire Territorial Army Association. In Raunds, volunteers were led by Capt V H Sykes (a local solicitor), who was president of the Raunds British Legion and the Chief Air Raid Precautions (ARP) warden for Raunds and District until he took up the LDV appointment. 11 men from Chelveston volunteered from the start. In June 1940, the LDV reorganised along the military lines of battalions (1,500 men), companies (200-300 men), platoons (20-30 men) and sections (6 men). The 8th (Wellingborough District) Battalion, under Lt Col H.G. Sotheby, covered the area around Raunds, Rushden/Higham Ferrers, Earls Barton, Bozeat and Wollaston, totalling 18 parishes, with its headquarters in Rushden. The Raunds LDV became "A" company and the Chelveston volunteers formed two sections (Nos. 5 & 6) of 5 Platoon of "A" Company. The Chelveston sections carried out their drill evenings in the Village Institute on Mondays and Thursdays. 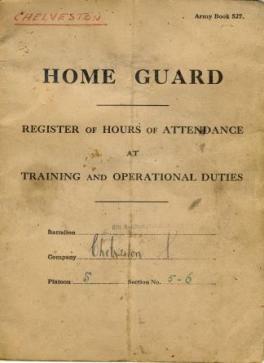 In July 1940, the LDV was renamed the Home Guard. In June 1941, Lt Col Sotheby retired and Capt Sykes was promoted to Lt Col to take over the 8th Battalion. Capt (later Major) A.H Freer (a shoe factory manager) assumed command of "A" Company. In March 1943, Major Freer died suddenly at home and Major W.M.Horrell assumed command of "A" Company. The Home Guard stood down on 1st November 1944 and officially disbanded on 31st December 1945. Members were given a certificate of their service and those who had served 3 or more years were eligible for the Defence Medal. Home Guard and Volunteer Services Armistice Day parade at the Church. 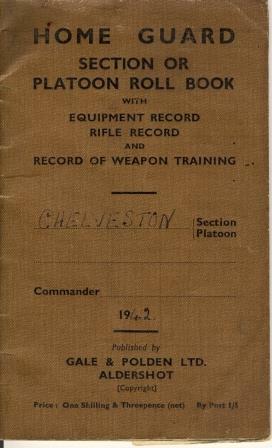 These records were obtained from the Chelveston Sections' Register of Hours of Attendance at Training and Operational Duties (Army Book 527) and Section or Platoon Roll Book (covering February 1942 to stand down) courtesy of Irene Bishop (youngest daughter of the late (Sgt) Percy Felce).